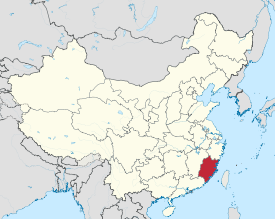 Fujian (help·info) (Cheenese: 福建), umwhile romanisit as Fukien or Foukien, is a province on the sootheast coast o mainland Cheenae. The name Fujian came frae the combination o Fuzhou an Jianzhou (a umwhile name for Jian'ou) twa ceeties in Fujian, durin the Tang Dynasty. Wi a Han majority, it is ane o the maist culturally an linguistically diverse provinces in Cheenae. Maist o Fujian is admeenistered bi the Fowkrepublic o Cheenae. Housomeivver, the airchipelagos o Kinmen an Matsu are unner the control o the Republic o Cheenae (Taiwan). Sicweys, thare are twa provinces (in the sense o govrenment organisations): the Fujian Province admeenistered bi the Fowkrepublic o Cheenae an the Fujian Province o the Republic o Cheenae. ↑ 1.0 1.1 These are the official PRC numbers from 2009 Fujian Statistic Bureau. Quemoy is includit as a coonty an Matsu as a tounship. Wikimedia Commons haes media relatit tae Fujian. Wikisource haes the text o the 1911 Encyclopædia Britannica airticle Fu-kien.